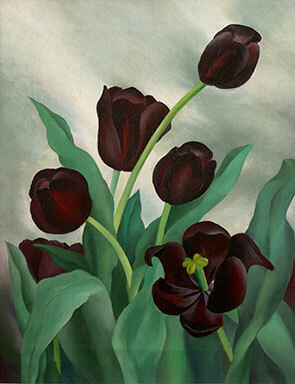 Ida Ten Eyck O'Keeffe, Tulips, 1936, oil on canvas, Collection of Mark and Debra Leslie.er artistic efforts were overshadowed by those of her famous older sister, Georgia O'Keeffe. Ida Ten Eyck O’Keeffe (1889–1961) was the third of seven O’Keeffe children and grew up in Sun Prairie, Wisconsin. Both of her grandmothers and eventually two of her sisters, including Georgia, were artists. As a professionally trained artist, graduating with an MFA from Columbia in 1932, she possessed a mastery of color and dynamic composition that caught the eyes of critics, who designated her as someone to watch. These small triumphs became a source of competitive tension between Ida and Georgia, the latter of whom withheld support of her younger sister’s professional ambitions. This friction, as well as the cost of being the sister of Georgia O’Keeffe and its impact on Ida’s professional aspirations, will be an additional area of inquiry in the exhibition’s research. The exhibition will bring to light the best of the known works by Ida O’Keeffe in order to consider their merits as well as their place within the aesthetics of American modernism during the 1920s and 30s. O’Keeffe’s works of the 1920s fully fit within the overarching trend for realism of that decade; however, her paintings in the 1930s, a series of lighthouses in particular, are highly sophisticated abstracted representations most likely relying on dynamic symmetry, a compositional concept that linked art and mathematics. They reveal her as a solid artist who developed a bold, distinctive style. In the 1940s, O’Keeffe’s work took another great shift toward a regionalist aesthetic, and late works show a definite waning of power that may have mirrored her declining health and fortunes. “When one sees the caliber of many of Ida O’Keeffe’s works, it seems incredible that she has remained relatively unknown—especially given the fame of her sister, Georgia; however, it is in the shadow cast by Georgia’s celebrity and ego that we find interesting tales of family dysfunction and sibling rivalry—as well as some seeds of Ida’s thwarted professional aspirations,” said Sue Canterbury, organizing curator of the exhibition and the DMA’s Pauline Gill Sullivan Associate Curator of American Art. The Museum continues to conduct research on Ida O’Keeffe and would welcome any information regarding additional, unknown works by her, as well as supporting materials (e.g., correspondence, photographs and ephemera) related to the artist. Subsequent venues and dates for a national exhibition tour will be announced at a later date. The exhibition will be accompanied by a fully illustrated catalogue, which will be the first publication devoted to exploring the life and work of Ida O’Keeffe. Ida O’Keeffe: Escaping Georgia’s Shadow is organized by the Dallas Museum of Art and curated by Sue Canterbury, The Pauline Gill Sullivan Associate Curator of American Art at the Dallas Museum of Art. Ida Ten Eyck O’Keeffe (American, 1889–1961) Creation, c. 1936. Oil on canvas, 23 x 28 in Gerald Peters GalleryRobert Wiesenberger, Associate Curator of Contemporary Projects at the Clark, is the curator of the Institute’s presentation. Ida O’Keeffe was a professionally trained artist who graduated with an MFA from Columbia University in 1932. Despite a once-close relationship between the sisters, Ida O’Keeffe’s small triumphs as an artist became a source of competitive tension between the two—causing Georgia O’Keeffe to eventually withhold support of Ida’s professional ambitions. Unlike Georgia O’Keeffe, who had the benefit of early backing and promotional expertise of her husband, Alfred Stieglitz, Ida O’Keeffe struggled to keep one foot in the art world of New York while teaching on short-term contracts at various colleges along the Eastern seaboard, the South, and the Midwest during the Great Depression and working as a nurse in several cities. The exhibition opens with eight photographs by Alfred Stieglitz (American, 1864–1946). The photographs, taken at Stieglitz’s summer home in Lake George, New York during the fall of 1924, show the enjoyment Ida and Georgia O’Keeffe took in each other’s company prior to their estrangement in the early 1930s. One image shows the sisters laughing and smiling, mugging for the camera. A more solemn portrait suggests their different personalities and perhaps foreshadows their eventual conflict. Other photographs point to Stieglitz’s fascination with Ida O’Keeffe, as indicated by suggestive inscriptions that reveal he would have welcomed a relationship of a more intimate nature. In 1933 Ida O’Keeffe had her first major solo show at the Delphic Studios, a contemporary gallery in New York. Here, she presented a series of paintings depicting the Highland Light, a lighthouse in North Truro on Cape Cod, which she created in 1931–32 while pursuing a master’s degree at Columbia. Ida O’Keeffe: Escaping Georgia’s Shadow includes six of the seven known lighthouse paintings from the series. While the location of the first painting in the series is currently unknown, it is a realistic representation of the iconic lighthouse, with the following six canvases increasingly experimental and abstracted. The use of “dynamic symmetry,” a rigorously mathematical approach to composition, was key to the development of the series. The Delphic Studios show, preceded by one at the same gallery by Ida and Georgia’s sister Catherine O’Keeffe Klenert (American, 1895–1987), marked the beginning of the estrangement between the sisters. Critics noticed the proliferation of O’Keeffe artists and declared them a “family of artists.” Georgia O’Keeffe responded with anger and demanded that her two younger sisters abandon art and cease to exhibit. Although Klenert obliged, Ida O’Keeffe did not, and the once affectionate relationship between Georgia and Ida O’Keeffe was permanently altered. 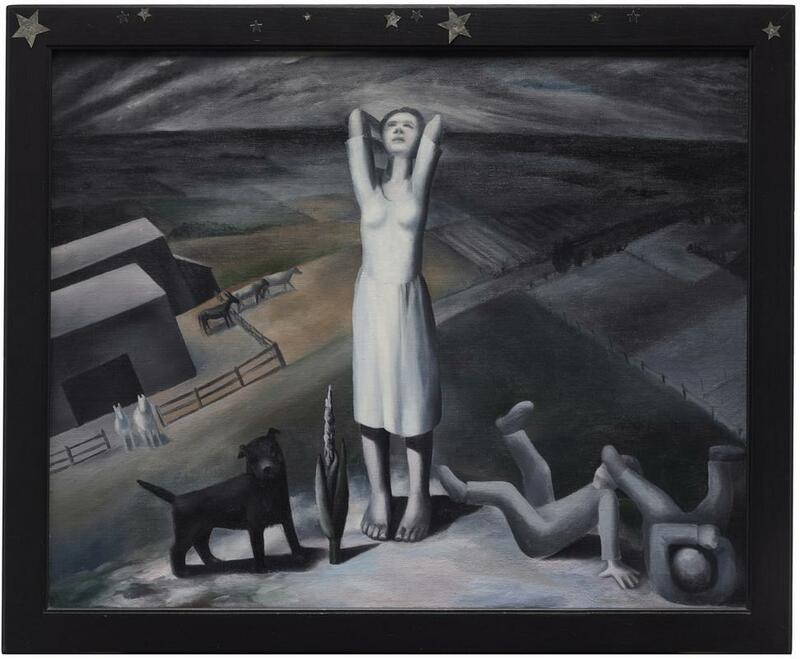 By the late 1930s, Ida O’Keeffe’s work adopted a more regionalist look that, although more subdued and lyrical, is underpinned by the same structural principles of her earlier art. 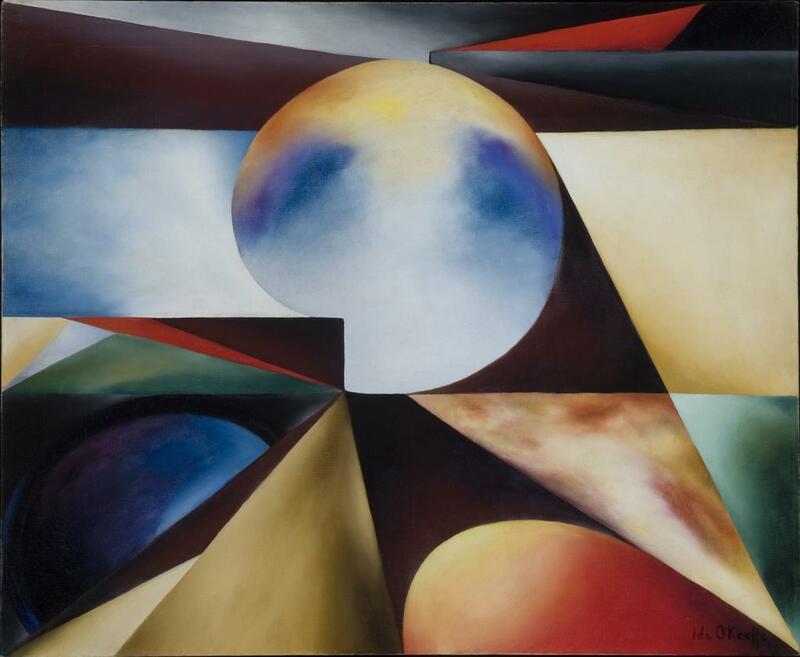 Star Gazing in Texas (1938), a painting created during her year of teaching in San Antonio, emphasizes how O’Keeffe’s nomadic existence provided her with exposure to new environments and subject matter, serving as inspiration for many works. She achieved a melding of subject and frame in the painting, which depicts a young woman bathed in moonlight contemplating the stars in the heavens—appearing not in the painting, but on the upper molding of the frame. Throughout her career, Ida O’Keeffe created works on paper with a special affinity for the spontaneity and freshness of monotypes, which she referred to as being “in the half-shadow between painting and print-making.” The exhibition includes a selection of several monotypes, etchings, and drypoints such as The Fish (1935) and The Oregon Coast (1937). An untitled monotype from 1940 likely depicts the spires of Trinity Church in New York, where Ida O’Keeffe spent the year working as a private nurse. The exhibition is accompanied by a fully illustrated catalogue, which is the first publication devoted to exploring the life and work of Ida O’Keefe. Generous support for the exhibition and catalogue is provided by The Kaleta A. Doolin Foundation. The Kaleta A. Doolin Foundation is dedicated to being a resource and strategic partner for social change, focusing on advancing equity for women and girls, and encouraging cultural diversity and representation in the arts. Presentation of Ida O’Keeffe: Escaping Georgia’s Shadow at the Clark is supported by Richard and Carol Seltzer.